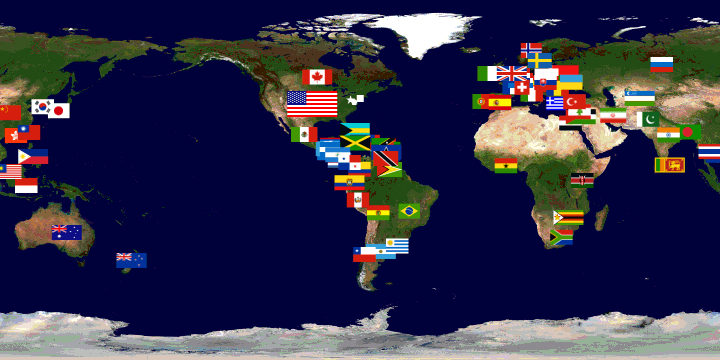 Mapping the New Isolationism: America First? The tortured narrative of the recent American election ended with something of a surprise. As we struggle to map their results, it is impossible to deny that they may mark entrance into a new world which may antiquate earlier forms and points of geopolitical reference, as global politics seem to be about to be destabilized in ways we have never seen. For in ways that reconfigure geopolitics which transcend national bounds, the extent of destabilization seems to abandon the very criteria by which we have been most familiar to map national borders, and indeed international relationships, as we enter into a new era of resistance, suspicion, and fear that dispense with international conventions that seemed established in the recent past–and internationalism rebuffed and international obligations and accords dissolved. Or at least, this was one of the few promises made by Donald Trump that appealed to voters that seems as if it will be acted upon. The very America First doctrine that catapulted Trump to the White House stands, for all its championing of national self-interest, to be best embodied by the removal of the United States from its role on the global geopolitical map. And the removal of the United States and England–achieved through the striking success of go-it-alone political parties in both nations–seems to show just how outdated a five-color map is to describe the world. The vintage Rand McNally map that claims to provide a world picture assigns prominence to the United States–and Great Britain–becomes the perfect foil and field to illustrate the impending uncertainty of a move against globalization across the western world. For the prestige of the globe as an image for the dynamics of global politics was long familiar as a part of the furniture of the Oval Office, as the stunning fifty inch diameter mounted globe that OSS director William J. Donovan had specially constructed for President Roosevelt, at the suggestion of General George C. Marshall. A stunning pair of monumental mounted globes were presented President Roosevelt and Prime Minister Winston Churchill by the U.S. Army as Christmas Gifts in December, 1941, which set on large bases on which they rotated for easy consultation. The globe embodied the newly emergent geopolitical order that folks as Donovan created and served, and which the OSS Map Division protected. Could we imagine Donald Trump gazing with as much interest or cool at a revolving globe? While Roosevelt stares with remove but interest at the globe, apparently focussing his eyes near the Straits of Gibraltar, this formerly classified Central Intelligence Agency photography was meant to celebrate his growing mastery over a theater of global war. The monumental “President’s” globes Donovan presented on Christmas 1942 to both Franklin Delano Roosevelt and the British Prime Minister Winston Churchill placed monumental revolving globes–each weighing an unprecedented 740 pounds–occurred at the suggestion of Dwight Eisenhower, with the confidence of “that they foreshadow great victories,” in the words of George C. Marshall, and Roosevelt proudly told the General that he treasured the gift enough to place it directly behind his chair in the Oval Office and to marvel at the ease with which “I can swing around and measure distances to my great satisfaction;” Churchill’s was sent by airplane directly to 10 Downing Street. The symbolic role of these large and weighty globes cannot be overstated: the large globes symbolize the complete mastery of geopolitical knowledge by both commander in chiefs in the midst of World War II; they show the investment of military forces in maps. The world map served in the post-war to embody the new global order already emerging during that war on which both understood a benevolent geopolitics destined to define American hegemony in the post-war; the Weber Costello globe company of Chicago, Illinois would construct some fifteen copies before going out of business in 1955. With sixty years of hindsight after the globe-making company shuttered its production line of deluxe maps, it seems the new United States President has opted to withdraw attention from maps. The iconography by which maps address their viewers might be framed in productive ways within historically situated economies of visual attention with interesting results. 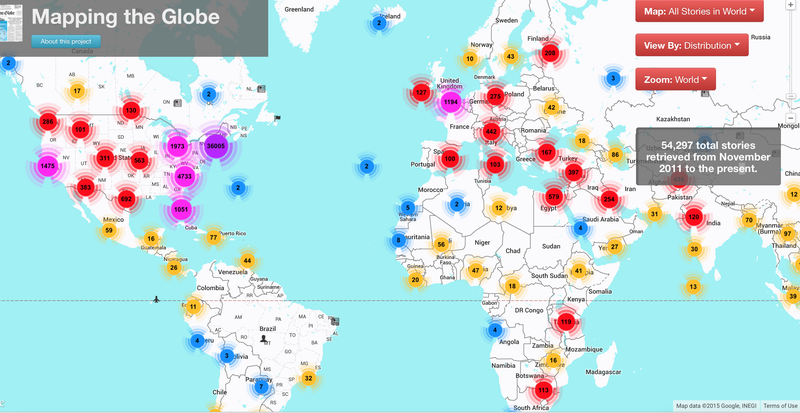 For as much as they reflect practices of production, the ways that maps have engaged viewers who struggled with new ways to grasp expanse reveal a dialectic between graphic invention and a larger marketplace images, despite the tendency of those who style themselves historians of cartography to focus on their formal qualities or the mathematics of geographic production. From their insertion at conspicuous places within some of the earliest printed world histories, mapmakers actively courted readers’ attention by crafting increasingly persuasive claims in aesthetically challenging ways, and by raising the stakes of their abilities to process expanse. 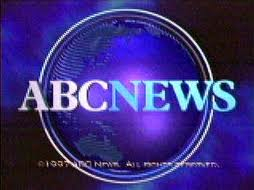 The promise to crafting a satisfying harmony of comprehensive global coverage has long existed in uneasy balance with their narratives. The success by which cartography and art communicate globalism might benefit from tracing the ways in which globes have long tried to engage their viewers’ attention. 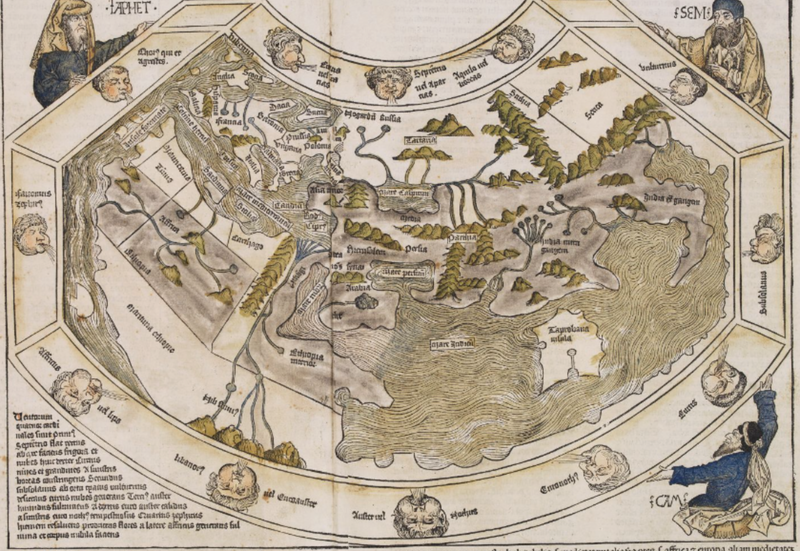 The woodcut of a world map below, designed circa 1490, defined a global purview for readers in ways intended to be cognitively satisfying, promising to orient them to unseen regions by scattered rivers and landmarks, even if they did so by using means that seem antiquated, being both of restricted scope and mediated by inherited ideologies of empire, Christocentric beliefs, and specifically Eurocentric models. But the promise of expanding horizons led this bold two-page map to be prominently placed in a universal history to mark the recession of waters in a post-diluvian world, suspended in the hands of Noah’s three sons–Shem, Japheth, and Ham–serves as a blank slate to inscribe a global history that proceeds to span across generations to the Resurrection of Christ. If the map of the world is crude by what we think of as modern standards, and possesses no clear spatial indices, the symbolic power of a planisphere of clearly Ptolemaic origins was modern: the engraved schema provides ways of orienting viewers to the lavishly illustrated book’s s expansive content as a comprehensive condensation of collective histories about the world’s regions–making good on the recent authority of such projections along latitude and longitude to reveal an aggregate history charging the growth of worldly and ecclesiastical power over the emergent consciousness of a global expanse, centered roughly on Jerusalem, inscribing a succession of empires over terrestrial space. Indeed, the discoveries of the New Worlds that were mentioned in the 1493 Nuremberg Chronicle (a compilation of universal history of somewhat scholastic origins known as the Liber chronicarum or “Book of Chronicles”) occupy small place in the service of describing the chronology of a succession of imperial ages that culminated in the ascension of the Holy Roman Emperor Maximilian I. The early world map that seems to have derived from a Florentine archetype was used to describe the recession of waters after the Noahic flood in ways whose power existed to set the stage for the rise of Greek and European empires, rather than the discoveries. If maps no longer convey such a stable sense of narrative progress, and such an engraving would no longer seem a marvel, most maps do considerable work in engaging an economy of visual attention. The world is with fewer open spaces than it was for Noah’s three sons, and global history resists linear narratives, despite the resilience of similarly terrifying apocalyptic notes, at times fed by a rage for biblical prophecy that generated sufficient demand for tracking daily fluctuations of a Rapture Index available for online consultation. Globalization demands adequate expression by a visual image that can engage its viewers, hopefully by more than the material underside of the interlinked–perhaps a map more fully revealing of the shifting nature of individuals’ relation to the inhabited world. 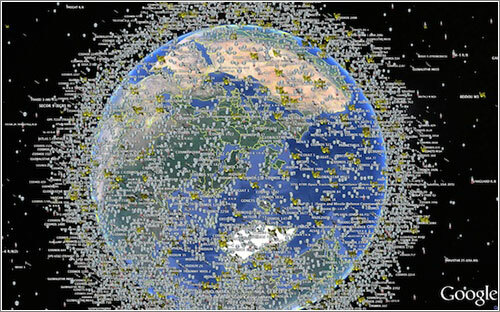 At a time when the earth is crisscrossed with media systems whose signals are relayed along 6,300 tonnes of satellites–and over 8,000 physical objects that orbit its surface and will outlast its inhabitants as a necklace of debris–we lack maps of how we inhabit the world or have remade our relation to it. 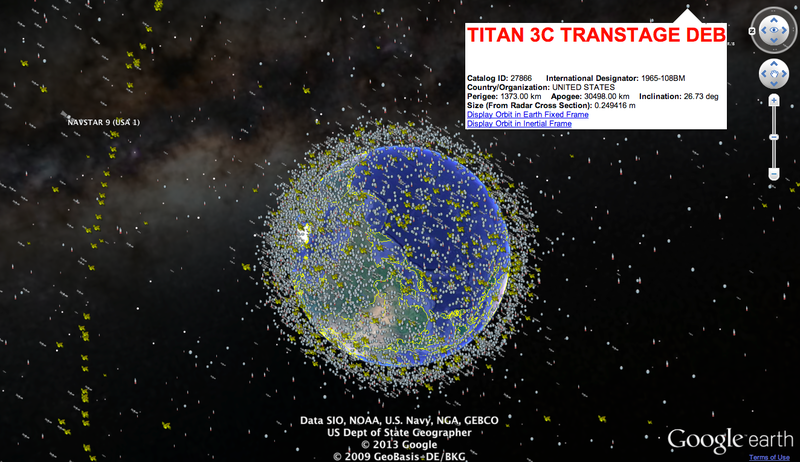 Such computer-generated visualizations offer the chance to visualize the satellites that track our changing global positions and information flows, relaying media world-wide over a multiplicity of interconnections: the image reveals what lies outside our visual abilities or comprehension–and which we would be otherwise all too apt to forget otherwise– by using government data to allow us to visualize the multiple layers at which satellites orbit our planet, even if they make it hard to track the wide array of signals that they transmit, intercept or surveil. But they were absent from the multiple covers that served to catch readers’ attention in the global-themed relaunch issue of the New York Times Magazine, a striking photograph of a suspended glowing globe, shot in a studio setting with an exposure that disorientingly overlaps the toponyms of Africa and South America, whose equatorial line seems to cut the globe in an unfamiliar place. 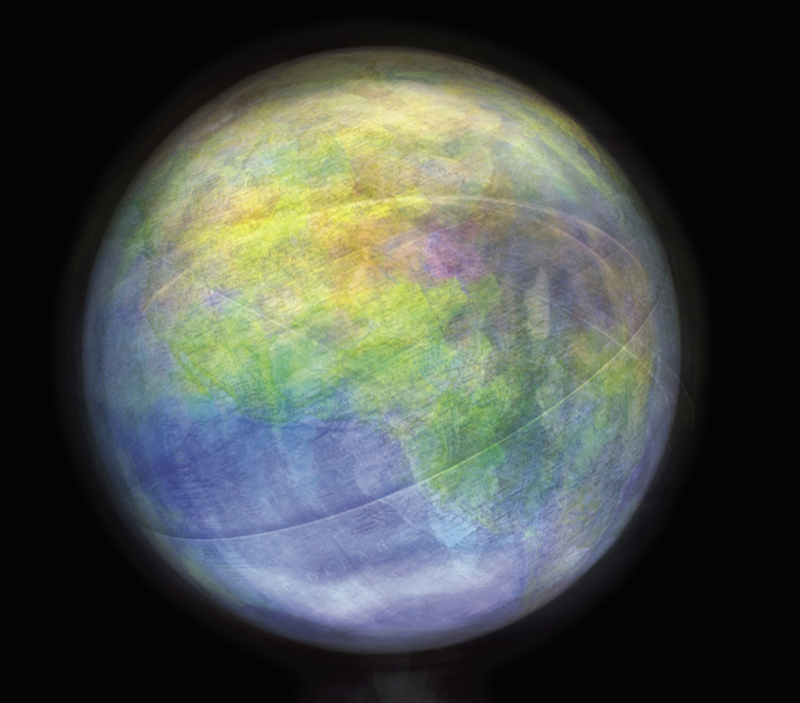 The maps offer an angle to contemplate the stunning long-exposure image of a rotating globe editors of the Magazine recently commissioned from photographer Matthew Pillsbury as a cover illustrating the rapidly changing world for a relaunch issue. The lit globe seeks to communicate both “the idea of chaos in the world, and how this is something we have all learned to deal with,” the design director observed. 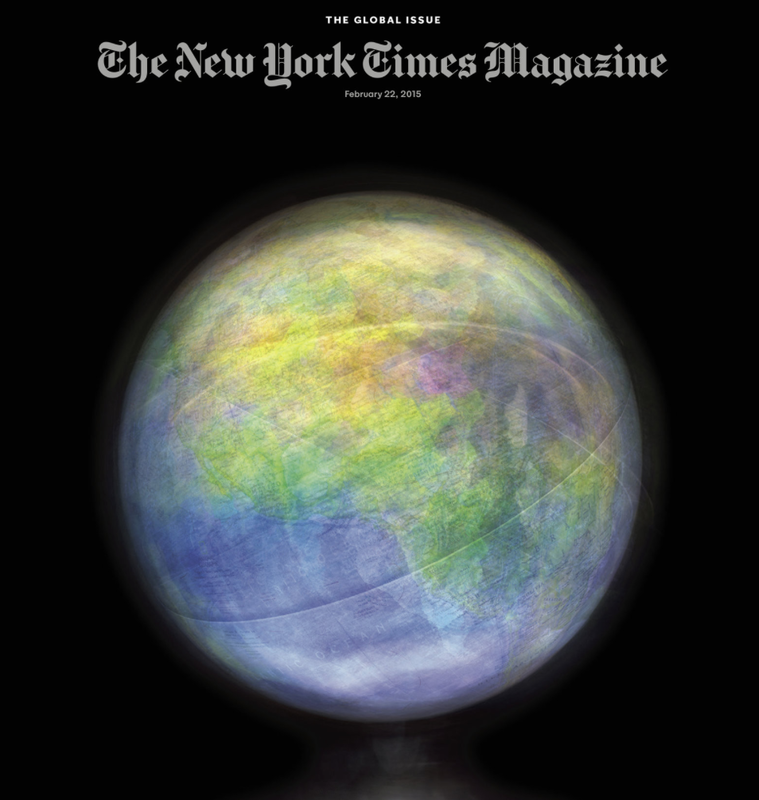 But the cover of the New York Times Magazine designed by Pillsbury demands attention both for how it holds the viewer’s interest and renders the globe as its ostensible subject. The photograph is an artistic interpretation, and compelling illustration that reveals multiple relations between art and cartography, as much as it describes the relations between nature and culture or between news media and globalization. 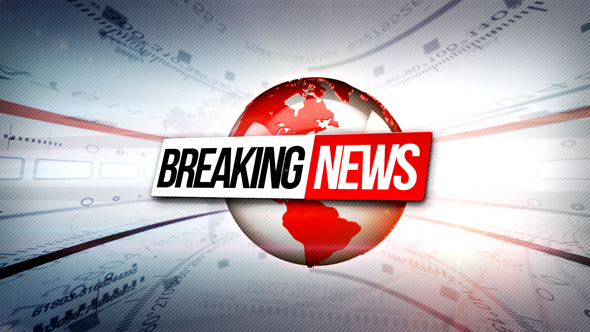 But if the image was intended to convey the “speed at which our world is changing” to readers, and presumably represent the news covered in its pages, it gives pause–even as an image that reflects on current quandaries of abilities to sustain the successful illusion of a promise of comprehensive news coverage in an ever-changing world. 1. The almost transient shadow toponymy in the globe as Pillsbury managed to photograph so that the names of Venezuela, Bolivia, and Brazil congregate in a ghostly region off the shore of Africa, and Europe is suitably displaced to its upper regions, suggests the shifting focus of the news, and even questions the familiarity of reading the globe though that most conventional didactic of mapping forms, a globe of the sort one might have encountered in a schoolroom when learning about world geography for the first time: the apparent overlapping of continents and blurring of the northern hemisphere destabilize our surety of global geography in an intriguing way, set, disembodied, above the words “HELLO, WORLD,” ask we re-examine the map we thought we knew. The five-color globe that appears in the header to this post is, in fact, while a welcome departure from the templates of Google Maps, similarly opaque in the very inscrutability of the very glittering image of earlier attempts to map the earth that it offers. Pillsbury’s long-exposure photograph of a spinning lit globe deserves interest as an advertisement of how the newspaper of record mediates news from a perspective that narrates a version of world news increasingly interlinked and less stable through a strikingly retro medium of mapping as a glowing globe. The photograph addresses how the shifting of what once seemed immovable territorial boundaries circa 1989 have not only been redrawn but shift with an unforeseen fluidity challenging to comprehend. Yet more than inviting us to interrogate relations, or the mobility of global populations and goods, the image almost aesthetically distances the spinning globe from viewer as much as it reveals levels of entanglement of places to one another and intensified contesting of sovereignty. 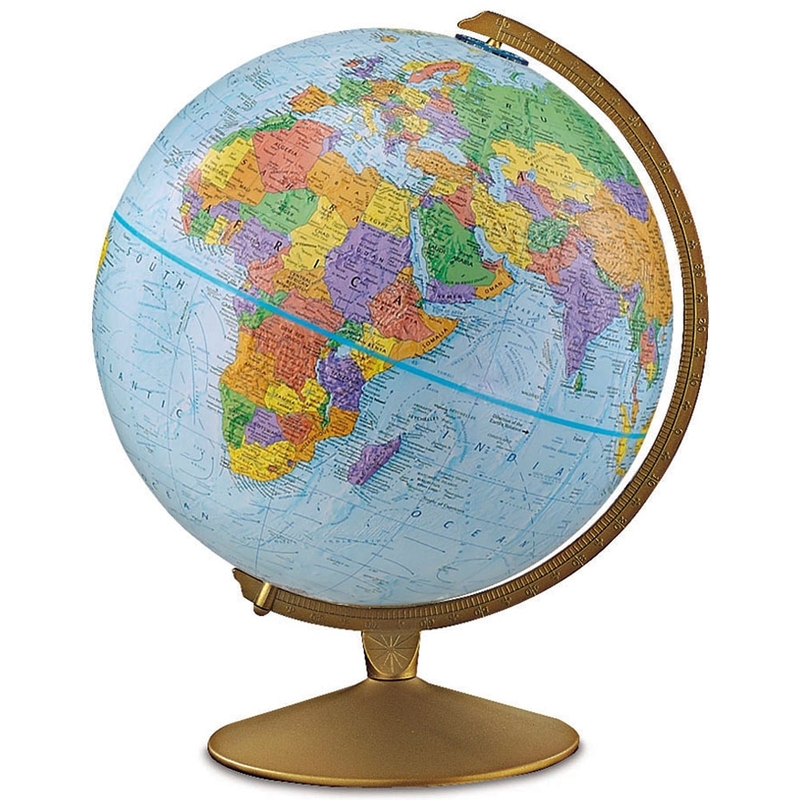 The blurred five-color surface of the spinning globe seems to abstract mapping from human geography. It not only suggests the opacity of its ostensible subject; indeed, it almost asks the observer to throw up their hands in something passing for marvel at the illegibility of a large area of familiar regions, and at the increasing entanglement of current events. It almost revels in being intentionally opaque, however, as if to say that the old indices of orientation just won’t work or clearly be commensurate to the take on current events that it will describe. 2. To be sure, in an age of the proliferation of maps on multiple platforms and hand-held devices, it’s refreshing to rehabilitate the schoolroom globe, and almost ask us about our current world’s distance from it. Oddly, however, Pillsbury’s cover employs an almost antiquated didactic object, a school map, relinquishing interactive mapping tools, to suggest the quick-changing world. 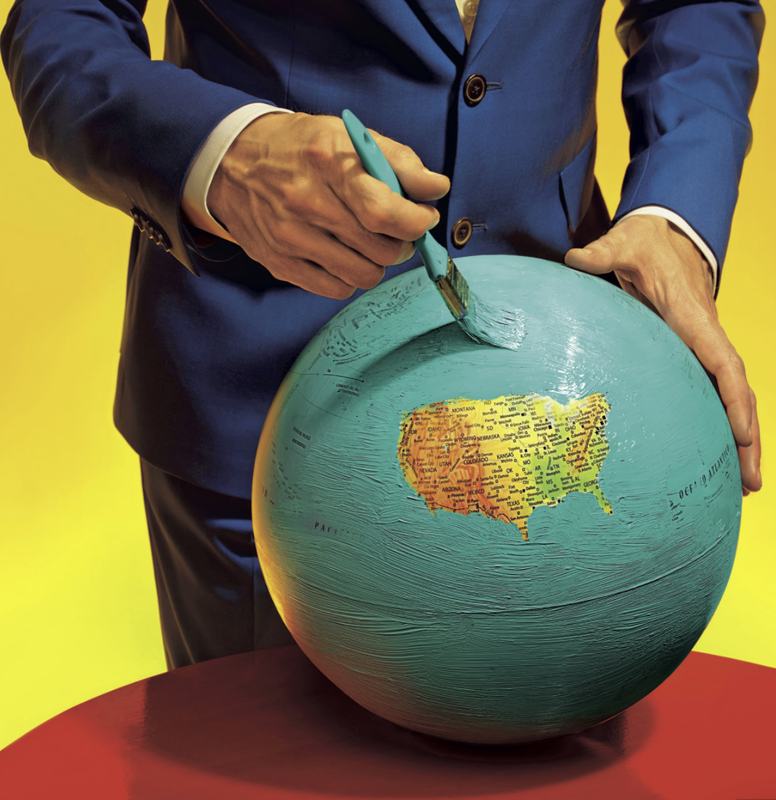 By spinning a schoolroom globe at high velocity to craft a visual pun to illustrate global change, the cover raises as many questions as it answers. What seems a conservative cartographical format-if here used somewhat tongue in cheek–as an icon of cartographical authority is almost prosaic. The sheen of the surface takes advantage of the conventional five-color globe of the world to seem to suggest a surface whose very colors and hues are so blurred to render them and all surface toponymy illegible, as much as an image of totality of global relations. As may befit the newspaper of record, the globe is steadfastly traditional in its familiar five-color design: it suggests a space by no means fixed, where boundaries around countries are redrawn and surfaces blurred for all practical purposes, but only tweaks the most standard image of the global coverage to suggest a disorienting sense in which we might lose familiarity in its geographical contours, rather than promise truly comprehensive coverage. For the globe’s illegibly blurred surface almost erases the considerable varieties of mapping by which we’ve come increasingly to understand and orient ourselves to the world, and almost relinquishes hopes for a new ethics of a world view, but just suggest the inadequacy of imagining the ideas of terrestrial location, proximity and geopolitics as received from earlier school globes. Is it that the idea of boundaries of knowledge are just not so clearly fixed after all, or that the problem of providing a single authoritative viewpoint is being explicitly acknowledged? What does it seek to illuminate? More troubling, Pillsbury’s photograph of a glowing globe offers us no place to decipher almost a single word: the effect is almost to see words swimming across its ghostly surface, unlike the transient figures that inhabit urban spaces in his stunning body of photographs of urban spaces. The notion of a commission from the photographer to create an image of global coverage might be misplaced. For Pillsbury has worked primarily in cities like New York, Paris, Venice, or London, using his knowledge of the local to much advantage, as well as Japan, more recently, where he’s taken advantage of a Guggenheim Fellowship to turn his lens toward explorations of Tokyo’s public spaces. His subjects have been less global than relentlessly cosmopolitan in scope. Pillsbury’s recognizable style is more than a sign that the Times seeks to cultivate readers as the hip newspaper of record by the image in this post’s header, as much as suggest an actual global purview of different spaces. The picture is almost a way of conveying just how difficult the job of the news is to convey all that’s fit to print, in a time when the world seems spinning faster than ever before. 3. 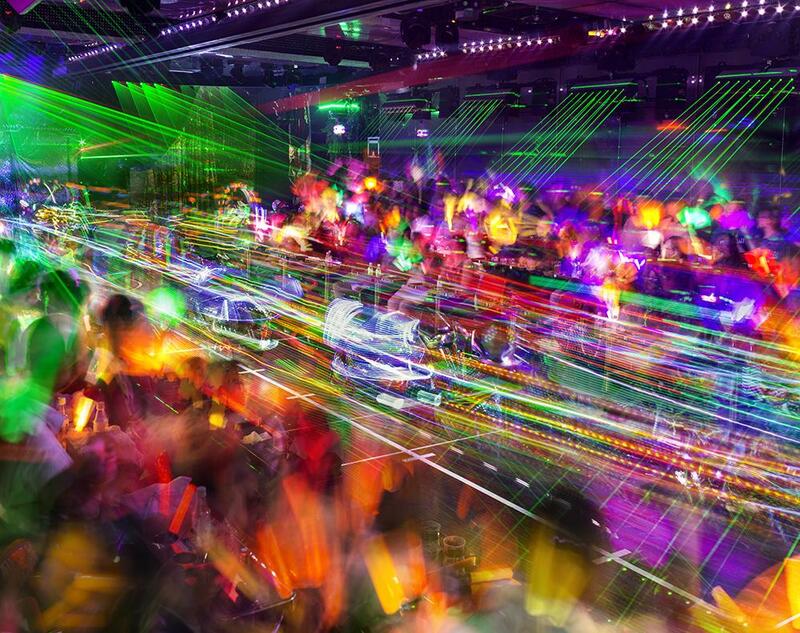 As an artist who has investigated the relations of crowds to urban space the spaces in New York that he knows well, often working to illuminate the “performance” of identity in interior or cavernous public spaces where individuals and crowds congregate, Pillsbury has cleverly employed extended exposure to blur the boundaries among individuals in urban space and place. The result is to question the relation of the individual to settings that might be otherwise familiar. The extended exposure of the globe is less of a site for staging events or a setting, than a surface just out of contact with the viewer’s eye. Despite the suitability of Pillsbury’s medium to observations of the interaction between individuals and images, or crowds visiting museums, such images are effective as encouraging ongoing visual investigations by expanding time in exposures from a few minutes to an hour that is collapsed into a single image. They indicate the changing “geographic imagination” by which we all inhabit different spaces. The spinning globe is photographed less to offer a record of lived space than an almost fetishized surface as an object, more than inviting viewers to consider the spaces that they inhabit; if the urban spaces can never be stopped or reduced to a purely static form, the globe is always in motion and hard to perceive save by the brightly lit sheen it presents. It recalls a past legibility of space, rather than propose a prospect of continued legibility. The photograph on the cover of the Times Magazine, despite its candy colors, contains a clear note of melancholy of the absence of hopes for adopting a clear relation to space, even as it radiates contentedness in that realization. The photograph is perhaps best taken as a meta-observation on the success with which maps can continue to command interest in a changing world. 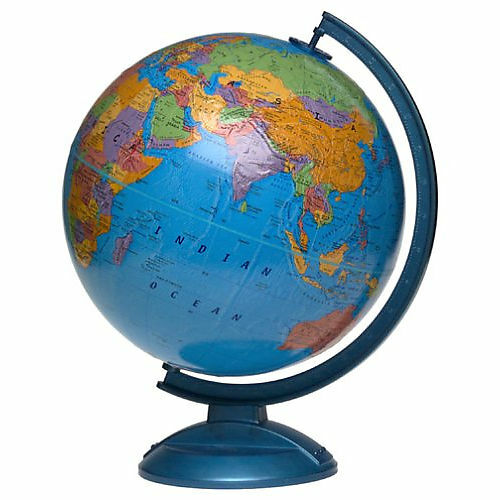 The candy-colored globe is an icon of cosmopolitanism, not primarily oriented toward coverage, blurring the notion of one-to-one signification, and almost attesting to its own inadequacy. That is not, however, the most confident self-image for journalism to project. And it hardly helps that we have to wade through about fifty pages of full-color advertisements for high-level commodities and financial services, speckled with small articles, until we find articles about the world in the Times‘ recent “Global Issue” that meet the promise its title posed, but raise some of the issues about which we might want to learn if we could better distinguish its spinning surface after all. 4. The photograph interstingly contrasts to how Pillsbury regularly runs long exposures to pose topics of visual interest that invite us to look at how spaces are inhabited in new ways, raising compelling questions about the construction of space and how we live in it, the globe’s familiar surface offers more of an elusive object of desire and a commodity–and not provide a space that invites us into it, and whose business invites us to sort outs its contradictions. For if the issue doesn’t really invite us to look at the world, so much as the advertisements suggest the globalized economy it serves, the sort of select writing that we have to wade through glossy ads to find is a deserved reward, but hardly a point of entrance. Another of Pillsbury’s images of a strikingly similar color palette suggests the pronounced permeability of place to humans, and explores a living geography defined by human interaction in ways static maps can rarely either work to successfully register. But the ghostly presence of the illegible globe almost suggests a world that can’t be grasped, about which we are as mesmerized as challenged to process information. Rather than invite the reader to interpret global space, the image seems a farewell to geography as a matrix of information, rather than the promise of global coverage made by most earlier symbolic maps in newspaper mast-heads or the animated backdrops of nightly news television shows. One senses that there is less interest in the history of an icon of spatial inter-relations, and networks of relationships, than an insider knowledge of how far we have come from the sorts of globes we used to use in school. 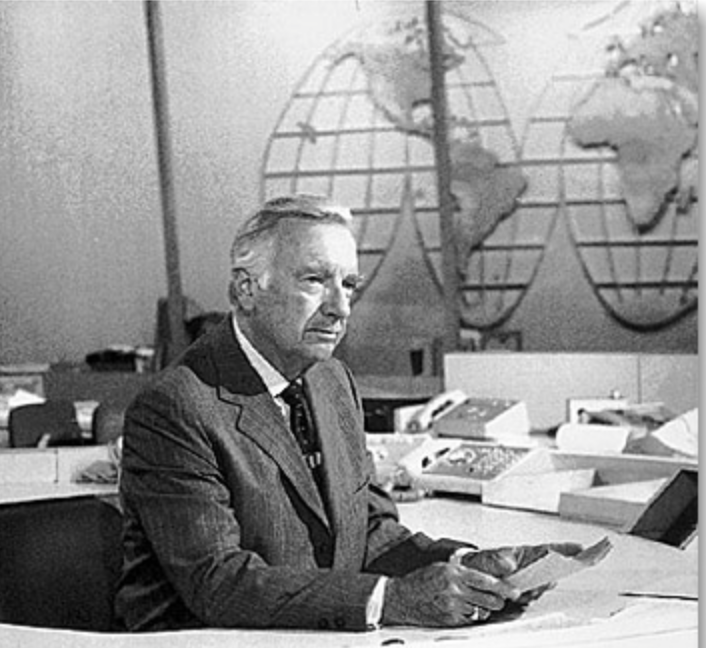 The photograph seems to gesture, however, to a long history in the twentieth century that takes the globe as a promise of the coverage that the news–or a news channel–could offer, if its iconic role seems to have considerably atrophied as it grew increasingly antiquated in current news graphics, which cultivate far more dynamic modes of visual engagement. 5. 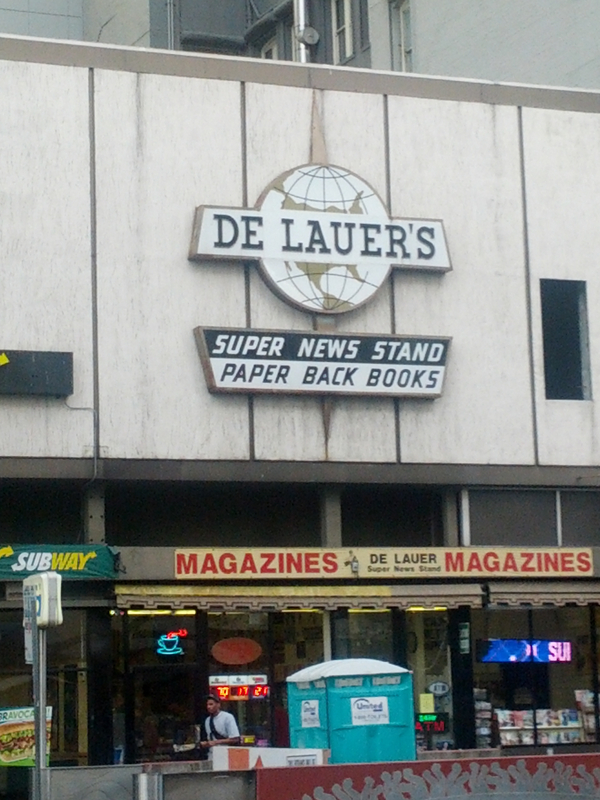 The iconic marquis of De Lauer’s News Stand in Oakland, CA, whose range of international papers made it a mecca of the hard-to-find remains a survivor of the on-line. The globe of its marquis dates from the Cuban Missile Crisis, as is perhaps evident in its charmingly corny magnification of the United States. The globe so prominent behind the name “De Lauer’s” in the marquis provides a notable predecessor of the symbolic promise of mediating global information, and the purchase of the authority of the globe as a promise of the delivery of objective information to a shifting readership of news; even if the prominence of the United States on the map belies the fact of the range of international news it continues to sell, the marquis illustrated the inter-connected nature of the world delivered in print daily to the door of an Oakland news stand. 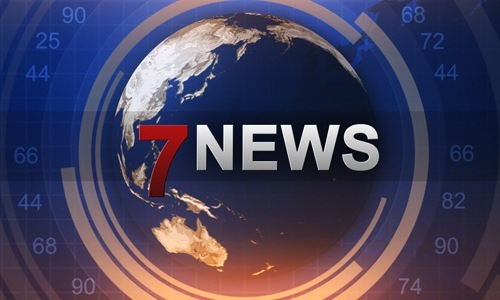 The image of the newscaster reading the globe was easily transposed to early television news for some years as an authoritative setting of addressing a public audience of viewers, back when news was of a considerably more univocal enterprise. 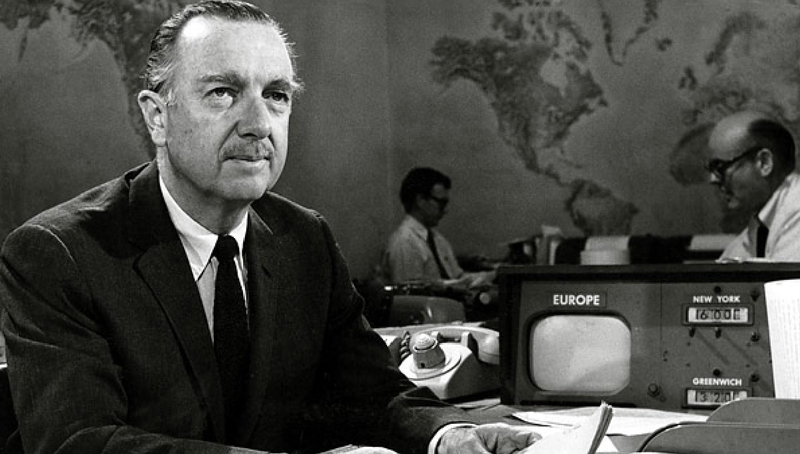 What now seems too a tired template for breaking news has retreated to a background of increasingly schematic form, no longer the authoritative site of enunciation from a position of expertise it was for Walter Cronkite’s newsroom, even as the studio backdrop map was recently reinstated for current newscasts. 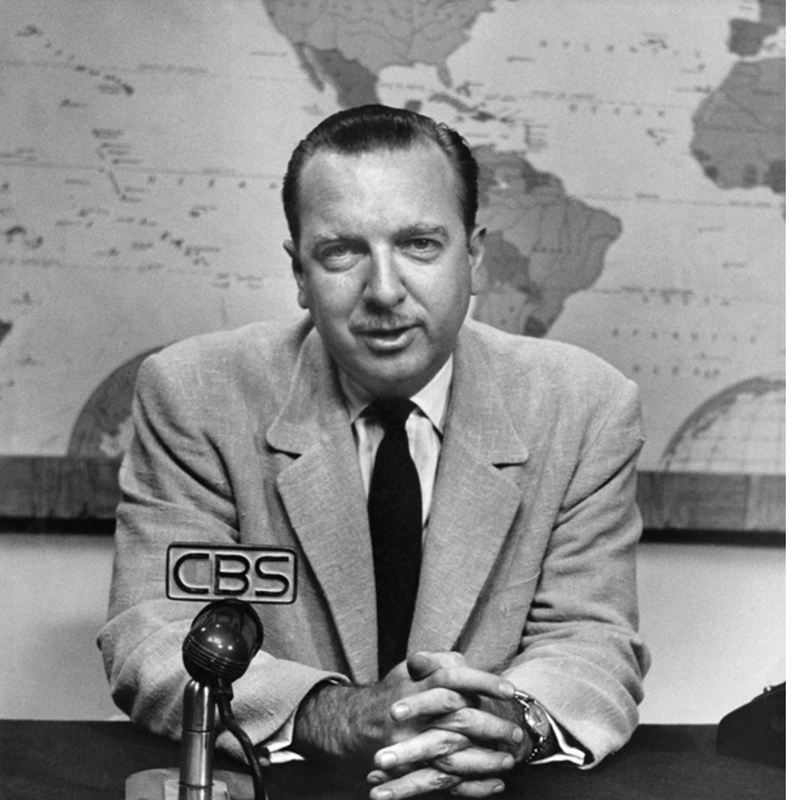 The map in front of which Cronkite spoke was something of the objective correlative of the reliability of the individual newscaster, or a sign promising continued confidence in his pronouncements, and was updated in the famous equal area Goode homolosine projection that was adopted for CBS Evening News. It’s unclear if this is still the case, even if the network has recently resurrected the same backdrop, it seems to lack comparable authority. 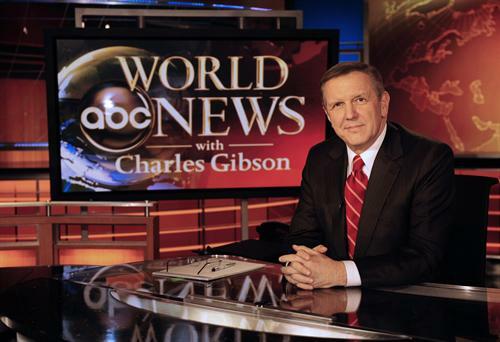 The stability of the globe has atrophied in network news, receding to a backdrop with strikingly less signifying power. The globe has become a glyph of reduced prominence and authority–not only because of compelling graphics, but as its meaningfulness seems increasingly worn and holds less promise or stages a narrative of global coverage not clearly attached to a somewhat overly tired symbol. No longer corresponding to the omnipresence of proliferating online maps in our worlds and on our other screens, the world map seems a superadded surplus, almost an older piece of mental furniture pressed into new service. It’s hard to say how much a static map can pose the pretense of authoritatively describing a terrain that seems so rapidly shifting and whose dynamics of power it could hardly capture. It is difficult to assert the globe’s a promise of comprehensive coverage, or successful a medium to hold the viewer’s attention. It raises questions of the picture of the world that we see refracted in the news stories that the Globe prints, and what it effectively filters out of the mix to provide its coverage of news. 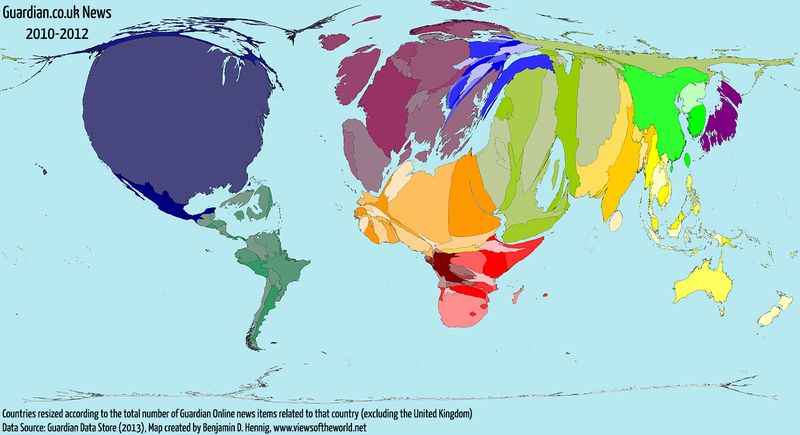 Even without actually drawing an proportional cartogram of global areas covered in stories that reach print, such as that created by developers of Worldmapper, from Hennig to Danny Dorling, which rescale the size of nations in proportion to how often it is mentioned in online news items, or to create metrics of places corresponding to the size of articles newspapers devote attention to them–and perhaps have retained active bureaus–newspapers hard-wire our brains to a global map or worldview we all too readily internalize. The worldview leads us to expect stories from regions of the world, and to suddenly make space for others–Ukraine; Liberia; Nigeria–aware that they may suddenly may disappear. This might be called the world we bring to the paper, as we first click on its homepage or physically open its pages, as much as the world that the paper covers. But the blurred world of shifting toponymy that Pillsbury preserves is more often one that lies just out of reach. The multi-media image of a painted-over globe seems to record the censoring of what we need to know, and what is to be seen–and presents us with the manicured image of what we know best if not a view of the world where censorship is the new norm. In the post-Snowden world, we cannot help but think about NSA’s efforts to infiltrate internet carriers and compromise global telecommunications networks without concern for international law–or treatises with the sovereignty of neighboring countries in the Caribbean: in this globe there is “an equal measure of terror and peace,” although the peace lies in obscuring of the world outside of the United States by blanketing the entire world with coats of light turquoise latex paint. Both images provoke us to consider the ways that the image provide commentaries on news as a space for learning around the world, or to orient ourselves to the dynamics by which we describe and are invited to investigate the world. 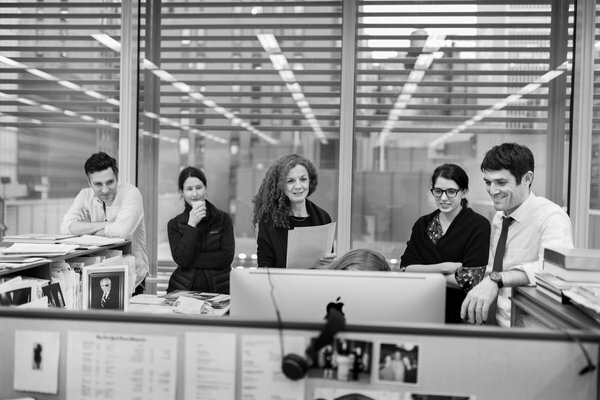 The mediated nature of news is, of course, not so tacitly commented on by the image of the editorial team that assembled the updated Magazine, young folks huddled around a large-screen Apple monitor of pretty similar ethnic identity and economic background, preparing the image of the world that will be soon ready to be consumed. Has the screen replaced the globe? The Chinese dissident artist Ai Wei Wei was clearly attracted to the prospect of creating site-specific sculptures for the cavernous nineteenth-century prison structures on Alcatraz island, a long unused federal penitentiary which concretized state power in the mind of many Americans over the last century, as a site to reflect on conditions of imprisonment world-wide. For the now abandoned structures of the hulking prison island still seem inhabited by ghosts of the past, and high on atmospherics, even as its space has been reclaimed by Ai’s site-specific remapping of the spirits of the imprisoned. –with limited interest in the rights or lives of the incarcerated who were allowed to live in an without light or sound and only a metal frame bed, sink, and toilet, and one pair of shorts for up to nineteen continuous days to enforce prison discipline. Alcatraz was not the first site of isolation by any means, but a site for its preservation where prisoners were forced to Personally, I find it is crucial to use moments of isolation as ways to develop self-control in order as in “control[ling] our inner self, we have won our first battle for freedom,” and the preservation of internal freedoms during imprisonment is celebrated in Ai Wei Wei’s installation. And at the same time as the use of solitary confinement has expanded, and unlawful detainees remain in the Guantanamo Bay complex of detention is not able to be closed while it holds five detainees, despite urging to congressional leaders for its closure, it is more than incumbent to remember the need to resist the civil rights violations of such inhumane units of segregation, and to draw sustainable to continue to do so–and to not forget the injustices daily faced by incarcerated populations. 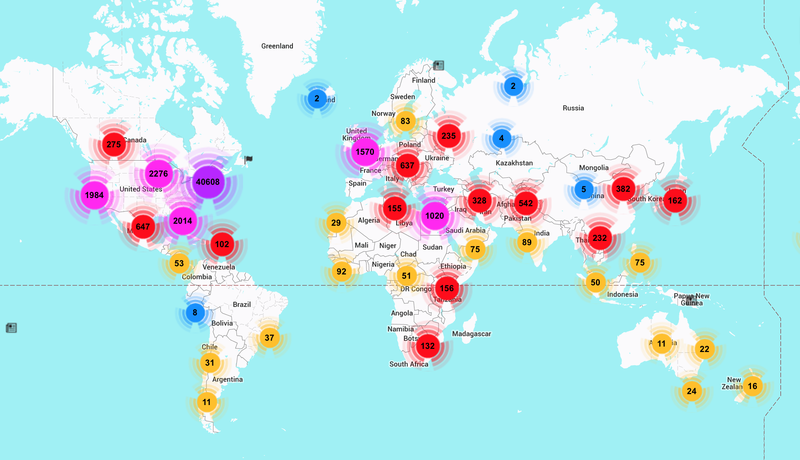 “We’re actually a part of the reality, and if we don’t realize that, we are totally irresponsible,” the dissident artist Ai Wei Wei has said about his work, and in being “part of the reality [of incarceration] means that we need to produce another reality”–and to map one. By replacing the colorless pavement of several of the Cell Blocks in Alcatraz with an alternate reality of vibrant colors not only of Lego portraits, but of the colored paper of huge dragons of the imagination, the austere burdens of the grey floors and pale green walls of Alcatraz are in a sense re-inhabited. Ai’s placement of a set of day-glo images of the imprisoned and detained within a former site of confinement famed as a site of solitary isolation, built in a former fortress in San Francisco Bay to be removed from contact with the outside world, provides a point of reflection on the reality of imprisonment worldwide. Using a plethora of pieces of lego, ceramic blossoms, and Chinese kites of dragons, and recorded song, Ai has both celebrated the possibility of ongoing resistance in the space of forced sequestration into a message of hope for all those detained, sending, despite his own limited circumstances of travel, instructions for media to inhabit the prison and sought to raise questions of the ever-encroaching global circumscription of freedom that ask us to map and to accept responsibility for the confinement of of global champions of free speech, and indeed to try to open the survival of spirit in the halls of imprisonment. Ai has long been committed to creating a deeply “social sculpture” and to do so through an awareness of the architectural space in which each of his works is constructed and situated, as well as the sense of space it creates for its viewers or users–from the analogue architecture of his popular blog or twitterfeed to built spaces to the deep sense of cultural inter-relationships that his work communicates. The canvas of pieces of Lego that temporarily filled the New Industries Building on Alcatraz Island presented an alternate surface of mugshots of recently confined spokespeople or human rights heroes in brilliant colored pieces of plastic–creating the sort of odd juxtaposition of form ant site, media across time, that wasn’t about imprisonment per se, echoing the pixellated images of each figure that we might see in mass media, filling the floor that lies above a basement filled with a wing made of tin teapots and solar cookers–the patience of the imprisoned?–whose confined space stands in juxtaposition with the airy room in which tourists crowded to see–and try to identify–the portraits of politically imprisoned in a mute surface made from $450,000 worth of multicolored pieces of Lego, converting one of the clunkiest of modernity’s concrete metaphors into a tool of subversive playfulness. –but rather an image of the bitterness of the global status quo. The flatness of the images push visitors to fathom the depths of the resources of their resistance, if only focussing on the bright surface of their spirits, but don’t expose their hand. The colored pavement of pixellated portraits of one hundred and seventy six recent prisoners of conscience map global imprisonment in a one-brick layer of Lego runs across the grey floor of a cavernous room of the abandoned New Industries Building in the former high-security federal prison. The choice of a world-famous former prison such as Alcatraz, isolated on an island in San Francisco Bay, by the For Site foundation to locate these technicolor mug shots of detained champions of human rights is particularly apt site. 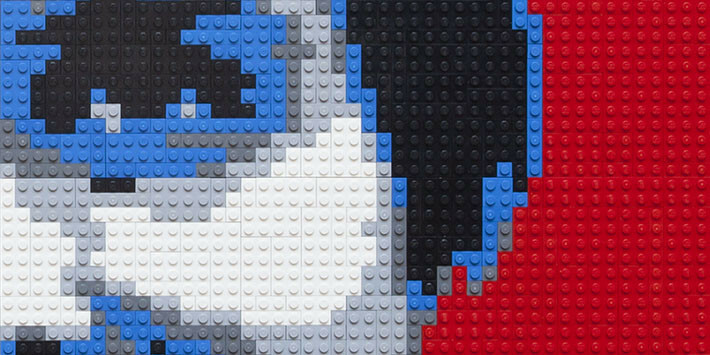 The temporary construction of 1.2 million Lego pieces serves as a canvas to commemorate the resistance of those charges or convicted of crimes in the complex of one hundred and seventy-six figures create an atlas of imprisonment–from familiar faces from the late Nelson Mandela (imprisoned in solitary South Africa from 1962 to 1989) to Aung San Suu Kyi (under house arrest house arrest in Myanmar for almost 15 of the 21 years from 1989 to 2010) to Liu Xian Bin to Liu Xiaobo (sentenced to eleven years of confinement in 2009) to Edward Snowden (forced to seek refuge in May, 3013 after leaking NSA documents) to the Iranian Shi’i cleric Sayed Hossein Kazemeyni Boroujerdi (imprisoned in October, 2006 in Teheran). Set in the floor of an abandoned structure of forced detention and prison work, the bright mosaic of faces is eloquent in its muteness and sense of survival. The pavement of portraits evoke colorized prison mug shots of those confined on the island. But they depict prisoners of conscience who are located on a global scope, creating a composite microcosm of different clusters of imprisoned from China to Iran to the United States to Burma to Russia. The new context for the assemblage of faces, included in Trace, are but one part of Ai Wei Wei’s re-use of the abandoned prison’s monumental buildings. They offer but a way that the Chinese dissident artist re-inhabits the buildings of the former federal penitentiary on Alcatraz Island in @Large. The work that testifies as much to his ability to work in different venues while confined under house arrest, as to call attention to the spirit of many imprisoned or confined who are apt to gain less media attention than the three Nobel Peace prize winners among them, and, although now disbanded, testifies both to the brightness and the fragility of resistance: the pieces are a composite whose delicate construction was always poised to be dismantled; rather than being laminated or glued to one another, the complex of Lego pieces was often nudged, fragmented, or jostled by the feet of visitors who sought to enter spots around the pillars the room of the abandoned New Industries Building to get a better view of the faces, and a sort of memory gallery of the global resistance of a human spirit. 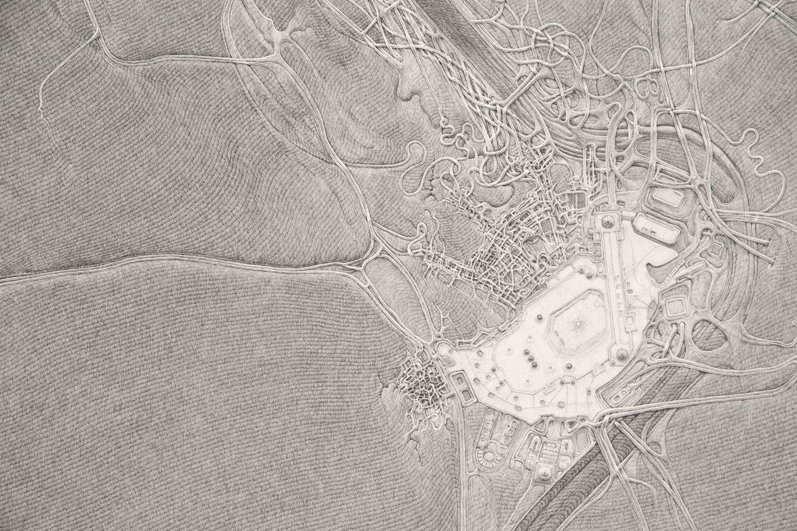 In surveying artists’ maps at the recent symposium “Mapping and its Discontents,” Katherine Harmon celebrated how “creative cartographies” oriented viewers to a narrative about place. If most of the presentations made viewers re-think the nature of map making as an art and science, Harmon’s attention to how the art of mapping create narratives about place at the symposium sponsored by UC Berkeley’s College of Environmental Design suggest the inadequacy of separating “cartography” and “art” by examining the map as an art of orientation–by how maps invite viewers relate lived space to the space that they create. In a symposium that raised questions about the seductiveness of the ability of how better-defined datasets can make maps that better capture processes we want to describe, it was refreshing to shift focus to how cartographical arts register an individual relation to place. Indeed, if several papers in the symposium struggled over how to bridge map and narrative–do we need to depend less on maps? to be seduced less by its promises of truth?–each artist returns to the dialogic relation map instill between viewers by orienting viewers to their content in ways that pose questions about the lack of personal detail in an undifferentiated record of space. In a sense, the survey of artists’ maps on which Harmon organized and explored exposed the artistic values in which all cartographical practices are embedded. 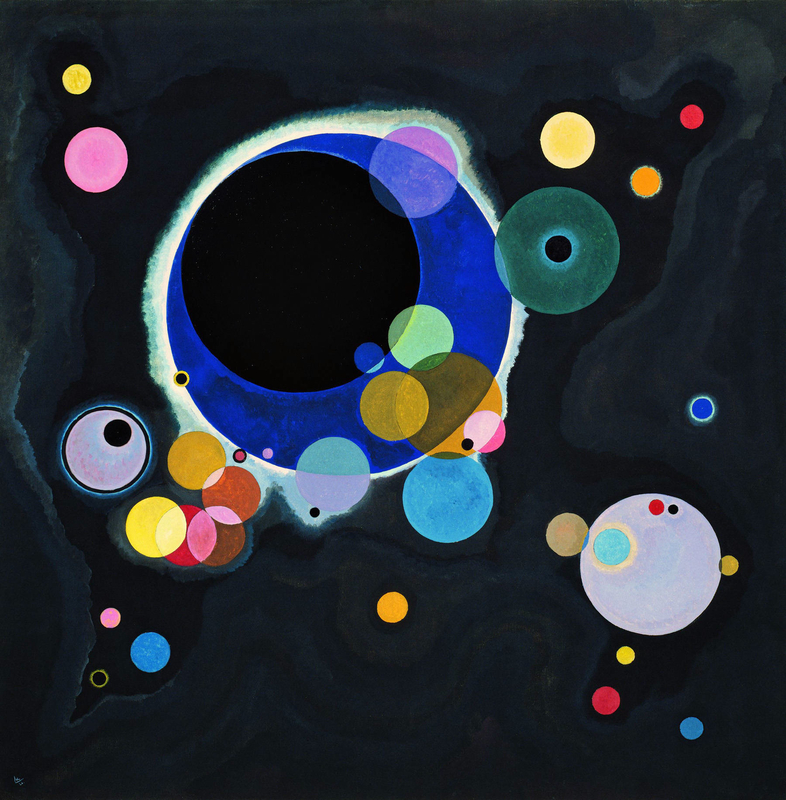 But they also pointed up the narrative ends to which cartographical forms were so particularly suited as joint representations and explorations of space. All maps engage their readers’ appetite for knowing a place, and even revise it, by creating a relation–a “map”–between personal knowledge and the residue of collective knowledge distributed in the design of their surface. The narrative possibilities for registering personal knowledge of space are particularly inviting in such an ostensibly objective framework of geographical denotation: Harmon called attention to the particularly eloquent transformation or adaptation of how the framework of mapping offers both a compelling and legible text by the forms of “deep mapping” that technology now allows–and the expressive form for deeply personal narratives they offer even as they threaten to lose specific details in the very process of generalizing a record of a uniform space. In an age where we are deluged by maps in all sectors of life, the tracing of these artistic strategies of mapping seems a recuperation of maps as orienting tools and arts of orientation, and this post surveys some of the maps that she presented, some known from other works, as serving to orient viewers in a practice of mapping that is often too removed or alienated from individual experience. For the ways that cartography can serve as a practice for engaging our different understandings of space in particularly inventive ways maps both feed cognitive by orienting viewers to place in revisionary (and potentially liberating) ways–by engaging viewers n how they uncover meanings about spaces one already thought one knew or believed to have been recorded in existing maps, by creating dialogue about spatial relations as much as to generalize a record of space. Harmon’s presentation showed less interest in how to tell stories in a map than in using mapping to register personal familiarity with place, by orienting viewers to the multiple personal networks in a mapped social space. The “creative cartographies” recuperate the artistic basis of mapping as arts of individual and collective orientation that exploited the structure of synthesizing spatial knowledge in a combination of ways. The narratives each cartographer creatively located in maps exploit the innate curiosity maps invite by orienting viewers. Harmon distinguished the narratives that several maps create; the “creative cartographers” all draw connections between the specificity of individual narratives plotted in maps and their structural designs. If the “discontents” of mapping lay in the anonymity of the maps of public space that were universalized for their readers in many digitized mapping projects and by government planning agencies from Rio di Janiero to Beijing to Ho Chi Minh city to Zagreb to the Google Earth platform, creative cartographers exploit the inventiveness invitations of maps place oneself in space by the power of making meaningful cartographical spaces by balancing them with a personal reading of place. Harmon invited the symposium to follow how creative maps buck the conceit of large data samples to inscribe maps with the personal meaning from a particular perspective–and in so doing, turn the abstracted nature of cartographical practice on its head, reminding us how such “scientific” practices are embedded in a discourse on the arts. Indeed, as they engaged scientific practices of cartography, they adopted the tools of mapping in as tools to chart a distinctively individual relation to a known space, rather than a universalized one–or, rather, they novelistically use the format of map-making to universalize the particular situated perception of space that maps rarely include or note. Harmon emphasized in her own visually stunning and compelling presentation the narrative content in these creative maps as setting into space individual stories about space that pointedly contrast with the de-personalized map and emphasized their own personal knowledge. She showed a set of creative cartographies that exist in a dialogic relation to our own knowledge of a place, moreover, and, more deeply, out knowledge of objective–as well as subjective–renderings of it, making creative maps particularly neat ways of opening up new perspectives on a space that fence in interesting ways with our own. Indeed, maps have a unique power to illuminate the relation between our story and our surroundings, as much as to tell stories of their own about how we understand place. The cognitive webs of connections that maps both embody and render visible and concrete have the effect of never seeing ourselves as isolated. They rather allow us to map our place in a set of other stories and narratives about place, in ways that are deeply social as well as rooted individual cognition. And perhaps the most problematic subject of mapping such an individual narrative–or restoring its centrality–is in as frequently a re-mappped event as the September 11 tragedy, whose multiple mapping has accreted more meaning on the event–as if it needed this injection–to erase its personal narratives, and imposed meanings on the event that have almost obliterated our memories of its occurrence, and our relation to its immense tragedy. It is interesting how she began from 9/11–an event that illustrated the tyranny of the map in the public imagination, and a touchstone for how a local event effectively mapped a geopolitical relationship to the world, albeit a quite distorting one. The event is not only ripe for re-mapping, but demanded a resourcefulness in using mapping forms to forge new networks of meaning in an over-rehearsed geographic conceit. 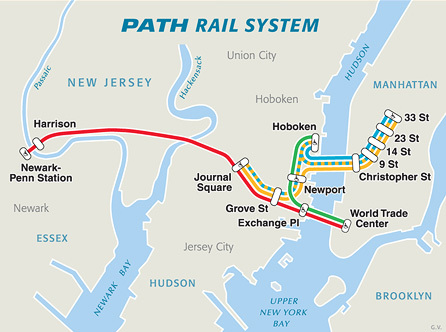 The artist Karin Shneider effectively re-mapped our cognitive understanding of events of 9/11–and the cognitive space of the twin towers–that re-framed memory of their destruction and the death of their unfortunate occupants in plate-glass maps inscribed with the commuter routes those who were tragically killed had taken on that morning as they arrived at work. The sounds of breaking plate-glass were inseparable for many observers of the twin towers’ collapse on September 11. In Shneider’s commemorative map, individualized etched glass plates restore both the fragility of their lives, and the integrity of each life that overlapped that day, providing a commemorative cognitive map of the event that viewers to consider how the event tied these lives together so tragically, tracing the routes each took to remind us of the voyages each performed that day. The set of maps commemorate the deaths of some 2,752 individuals by distilling the circumstances of their spatial intersection, giving specificity to that over-photographed and documented event by emphasizing their now unrecoverable perspectives with the evocation of personal letters or diary entries, so unlike the opacity we usually identify with maps, inviting us to see through their commutes to remember the loss of individual life. 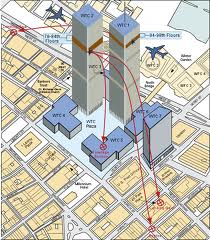 The map of approaches to a final intersection replaces the all too familiar rendering of collision courses of two airplanes on September 11. Shneider’s composite of overlapping maps remind us of the very difficulty of recuperating individual narratives in such an over-narrated event–mapping the mess of lives that intersected fortuitously that morning, and which will no longer be with us. They reframe an event too often framed as a war on “terrorism,” “clash of civilizations,” or a sign of barbarity and civilization in distorting and exploitative ways, moreover, giving transparence to the very surface of the map. The absence of a one narrative that unites these paths is, indeed, a great part of the effectiveness of capturing such multiple individual itineraries within one map. That map’s argument is disquieting because of how it erases individuality. 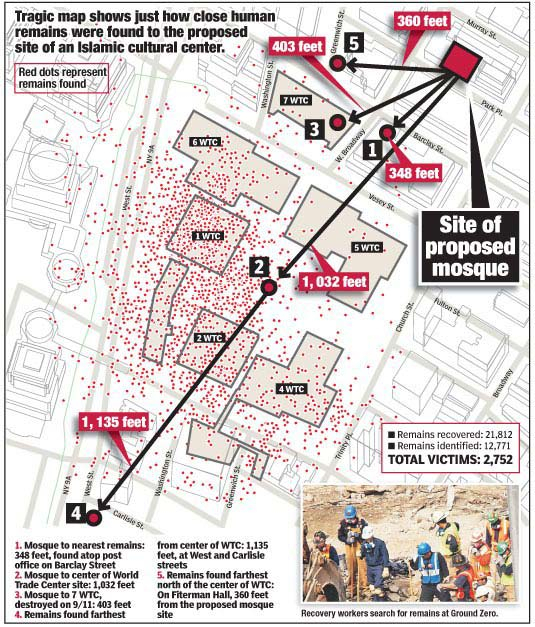 Mapping can be a clarification of such tragedy, however. The far more delicate set of superimposed plate-glass maps Harmon described stands in contrast to the anonymity of this map, or the very disembodied and abstracted map of the routes that these hijacked planes took, by inscribing their paths at a complete remove from individual lives. 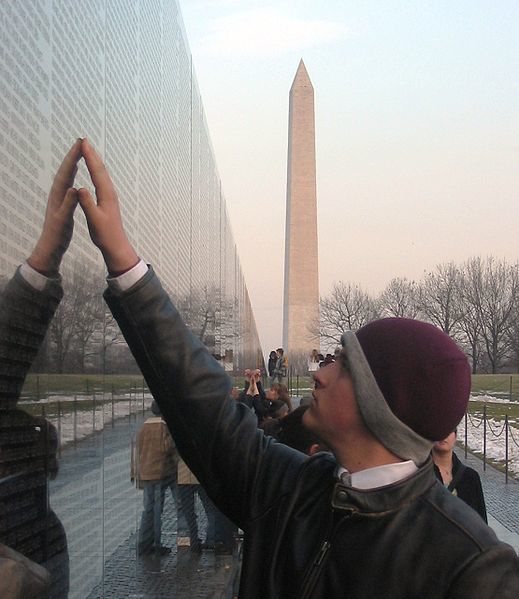 Indeed, even the inscription of names of those killed in the event at the site itself on a granite plaque, evocative of the Vietnam Veteran’s Memorial, oddly strips them of individuality–unlike how the reflecting stone surface of the Vietnam War Memorial designed by Maya Lin invites viewers to touch individual names on its surface, as if to try to map abruptly curtailed lives. The inscription of the names of the dead of 9/11, unlike Maya Lin’s monument, offers no attempt to embody the event–or to express the multiplicity of narratives that that event so tragically condensed. For if the violently voyeuristic map seeks to dignify the site’s sanctity by delineating the violent loss of life, its superfluity of meaning is something of a recapitulation of violence, attempting to shock the viewer as does the inset photography, by providing some access to the history of the event. –with attentiveness to precision evident in this detail of the links he creatively mapped between both houses of worship. Departing from digital simulations that often create information overload, Zeller’s craft-like remapping places with the symbolic continuity that maps create to all too improbably link two sites so often separately segregated in the global imagination. 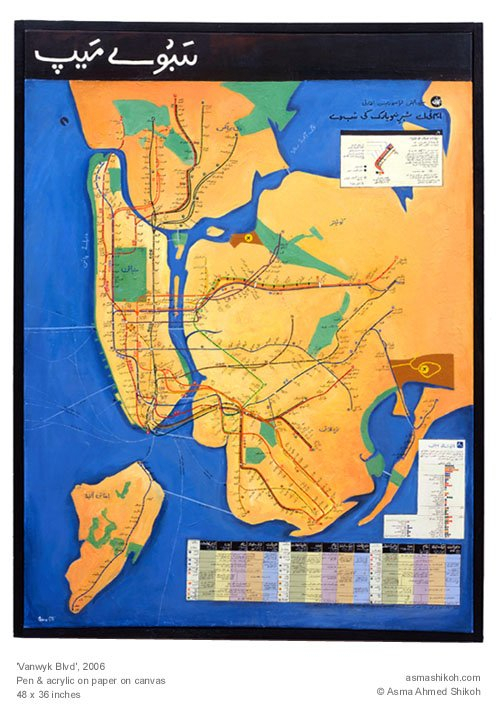 Bridging divides through a pathway that itself unites or crosses cultures is the theme of Asma Ahmed Shikoh’s beautiful acrylic “Van Wyck Boulevard,” part of her project “Home.” Shikoh’s art maps her status as a Pakistani artist trained in Karachi who moved to New York: “Home” brilliantly reclaimed the craft traditions of mapping, recasting the NYC subway map as an Urdu manuscript and within a geometrical design borrowed from the Islamic Al Hambra, in Spain, to reexamine its functional status, and its role as an icon of urban belonging at the same time as mapping a Muslim diaspora–precisely by casting the map of the path of the MTA’s “F” line that took her to her first home in the city. Shikoh reconfigured the map in a painted form of distinct coloration, engaging its form as well as using language as a tool to assert my identity and make the new place my own.” The widely reproduced and iconic subway map served as a template to assert and recreate the familiar embodiment of the subway lines as a constellation of meaning invested with a narrative intent that the location of stations on this diagram rarely possesses: only by “transliterating every stop, was painstaking, repetitive, and yet therapeutic for a newcomer” that traced a narrative through a process of remapping and making the city her own– using the subway map to transcend the increasing construction of a dichotomous divide between East and West, and re-center her identity (and immigrant identity) in the mobile paths of New York City’s subways. Cross-generational mobility was mapped through the shifting degrees of access or familiarity with space across generations in a map of the town of Sheffield, Harmon noted, when Dr. William Bird traced i the limits of known space created across generations living on an aerial view of the city that redefines the mapping of “city limits.” The chart of the boundaries of a “known world” where children were entitled to walk unaccompanied in Sheffield provides a far more general (and very poignant) map of a demographic group’s relation to space, investing the map with particular narrative and expressive properties beyond that of a spatial register. As much as describe the changes in Sheffield’s geography and the story of its expanding industrialization, the map presents a strikingly local microhistory which echoes and encapsulates frequently expressed concerns about the lack of exploring a safe urban space. It was made in the capacity as health officer to Natural England, to substantiate a concern for Bird’s belief in the benefits access to grassy areas, ponds, and trees brought to kid’s behavior and school work, and question the healthiness of the narrowing relations of space from George, his son Jack, his daughter Vicki and the eight-year-old Ed. The creativity of these practices of cartography bucks basing maps on their synthesis of a large data sample, by questioning how maps can be creatively rooted in a narrative of individual experience, even in ways that preserve their value as a collective register of the experience of space–and how a Google Maps template might be distinctly personalized as a record of spatial knowledge. 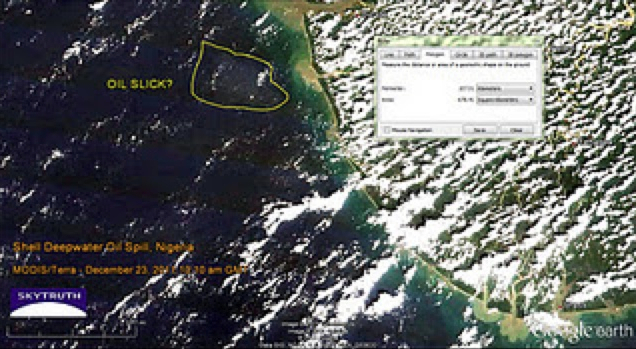 Discontents with Google Earth maps lie precisely in the deeply problematic recuperation of a cartographical art that they perpetuate for their users. And so Jeff Sisson focussed on the spatial meanings and consequences of the threatened disappearance of the Bodega as an institution and anchor to urban communities in New York by crafting an interactive Bodega Map within the city’s expanse. In charting the survival of a store central to communities across different neighborhoods, the map almost anticipated the recent turn against Mayor Michael Bloomberg’s New York that the recent De Blasio victory seems to portend. 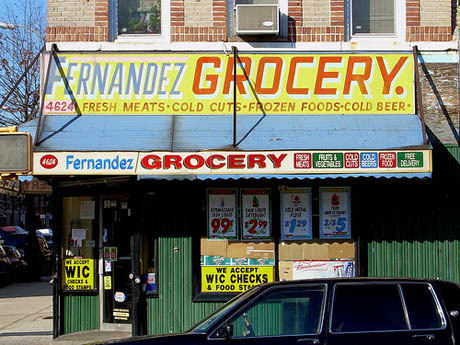 In tracing the footprint of the institution of the Bodega, Sisson selects stores pressed out of existence in the absence of rent control for shops in the city’s expansive real estate market, and provide evidence of a vanishing urban culture of diversity. Sisson’s website invites all visitors to place Bodegas in local neighborhoods to elevate the individual discovery of a community store, in an exercise of collective crowd-sourced participatory mapping that displaces the archipelagic city’s usual contour lines by rather trying to map the local meanings of these distinctive and useful stores within local communities, in ways that invite one to insert one’s narrative connection to the colorful local Bodega so long an urban fixture situated at odd street-corners, combining such mapping resources as Google Earth, Google Maps, and Flickr snapshots of facades and marquees of individual family run stores. The project “Mapping Bodegas” tracks processes of micro-urbanism, by marking sites of interaction and stages to which communities respond, to reflects on the danger of their erasure from the city’s map and its neighborhoods, as well as to preserve meaningful “hot-spots” of collective memory within outlines of the specific neighborhoods they nourished. This infusion of narrative content is, to be sure, one reaction or response to the universalized abstraction of an anodynely marked places of interest in the space of Google maps, with something approaching a zero-degree of the denotative signs of registering affect or place. 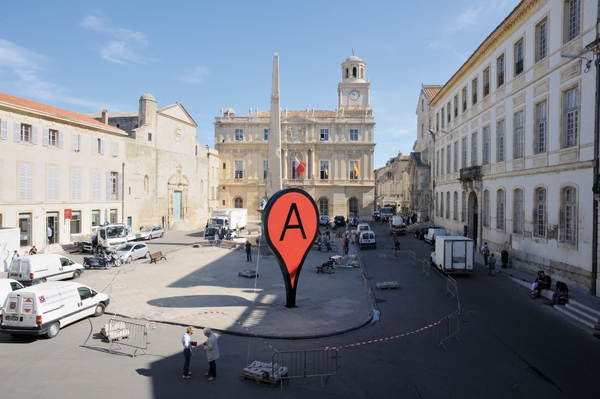 It is in reaction to this lack of narrative that Adam Bartholl staged his public sculpture “Map,” creatively appropriated the blandly uniform “inverted tears” of a Google map push pins by placing these physical objects in the very center of Arles–on the hexadecimal longitude and latitude GoogleEarth uses to denote Arles. 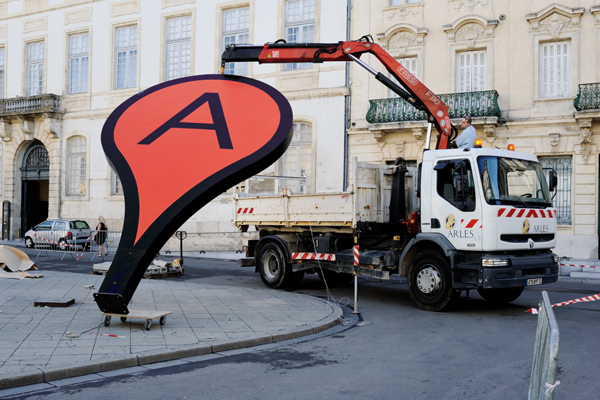 The discontent with the abstraction of our knowledge of place in Google Earth led Adam Bartholl to remind us of the increased distance between iconic cartographical markers Google employs so blithely in its tiles and knowledge of places they denote. 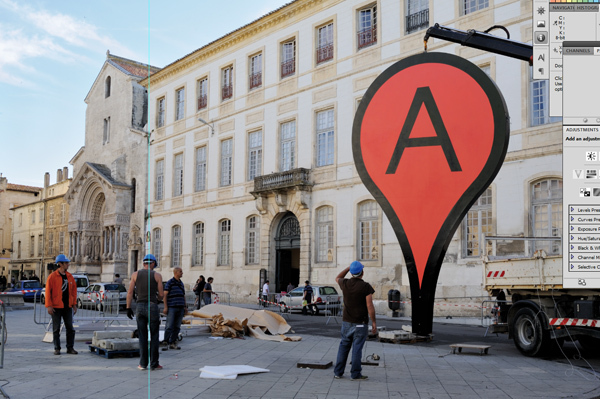 By the co-option or appropriation of the sign of place in geolocation practices in the public square of Arles, Harmon argued, Bartholl reminded us how the marker shapes (and fails to capture) our sense of place, as we use it to make our narratives of travel: by placing a larger than life physical embodiment of such a dayglo pushpin in the exact center of Arles’ public square on the altitude and longitude where it occurs in Google Earth, Bartholl asked us to confront a physical embodiment of a sign we too often internalize without interrogating its affectless muteness as a sign as itself a denaturing of place. Arles? It happened right here . 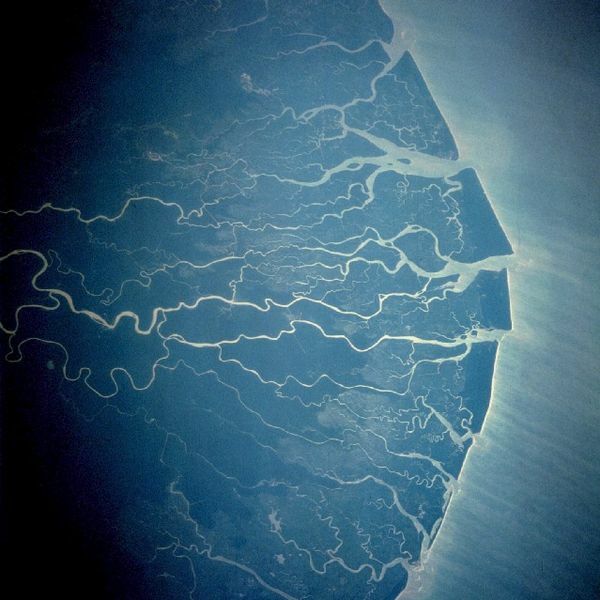 . .
On a more political level of the silences concealed in many maps, and the environmental consequences of these silences, Harmon turned to the failures of mapping ecological disasters of Bonga oil spill and transformation of the Niger delta. 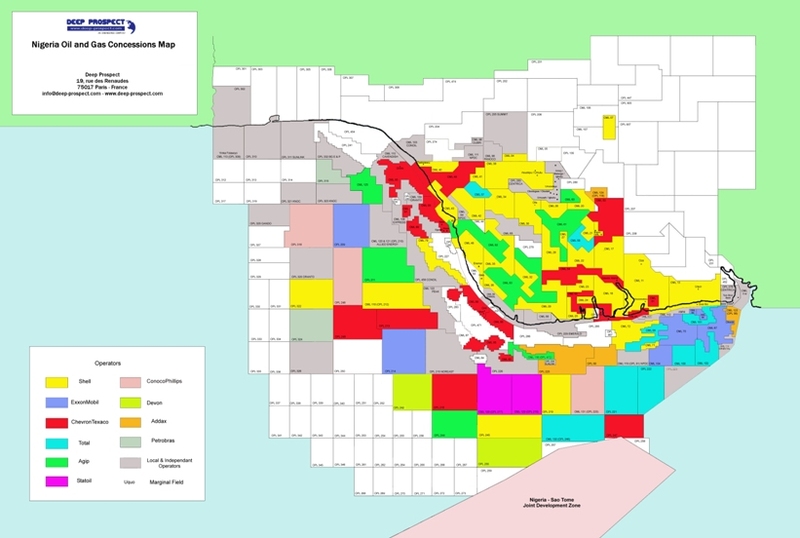 What are the limits of Google maps in tracking the multiple levels of ecological disaster within the Delta, seat to a preserve of some 600 million barrels of recoverable oil mapped in 2001, but whose mapping silenced the complex narrative of regional toxic pollution that has spun out around those platforms and oil rigs. The delta, an oil-rich area long plagued by irresponsible levels of annual oil spillage greater than in the Gulf of Mexico Deepwater Horizon disaster of 2010, is a site of widespread flares on rigs, and, as a very poor area where oil was found close to the surface, of dirty DIY oil refining and extraction have created deep-set ecological disasters through the Delta–over 7,000 spills from 1970 to 2000, some spewing at least 9 million barrels of crude into wetlands that sustain millions of local trades from fishing to agriculture, and where consistently poor clean-up of spills have eroded increasingly fragile local communities and economies in an image that, viewed from space, appears both ecologically fragile and remarkably pristine. 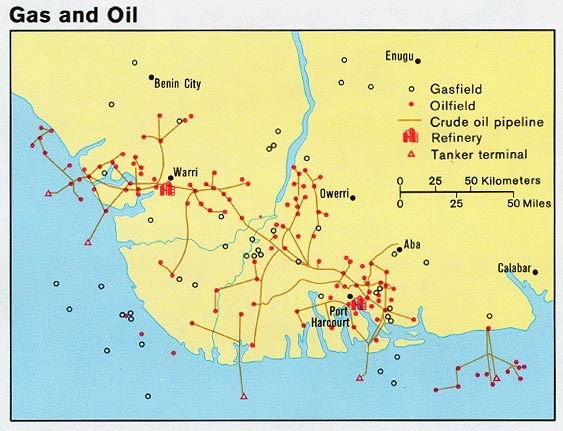 How to map the devastating ravages to the local environment, whose production the Nigerian government is economically dependent, is particularly problematic since the oil-rich delta is the source of 90% of the country’s foreign earnings. 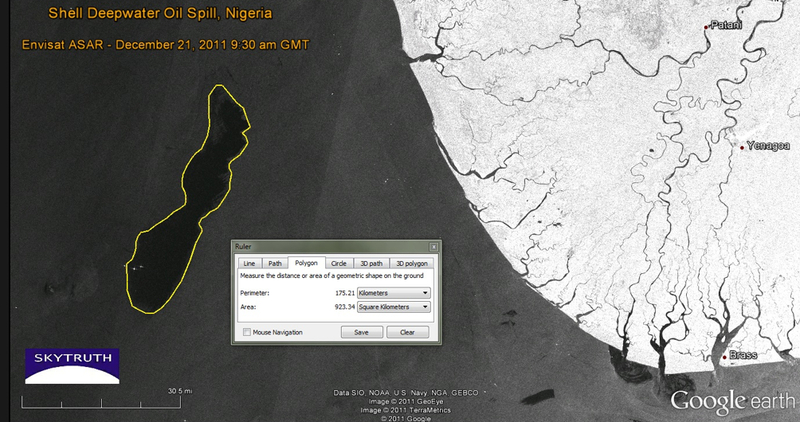 Regular under-reporting of spills by NOSDRA–the Nigerian Oil Spill Detection and Response Agency–to keep in line with corporate claims led to a failure to register the escape of up to 60,000 barrels of oil in 2011 from one Floating Production Storage and Offloading Facility at the Niger delta’s mouth by Shell oil (Nigeria’s major client) in Bonga, or 1979 spill of 570,000 barrels of crude, also by Royal Shell–eroding the environment all up the Delta, by the devastating toxic effects of acid rain that are only starting to be mapped–from the ruin of coastal livelihoods and fisheries to deadening formerly plentiful fields of kola nuts. 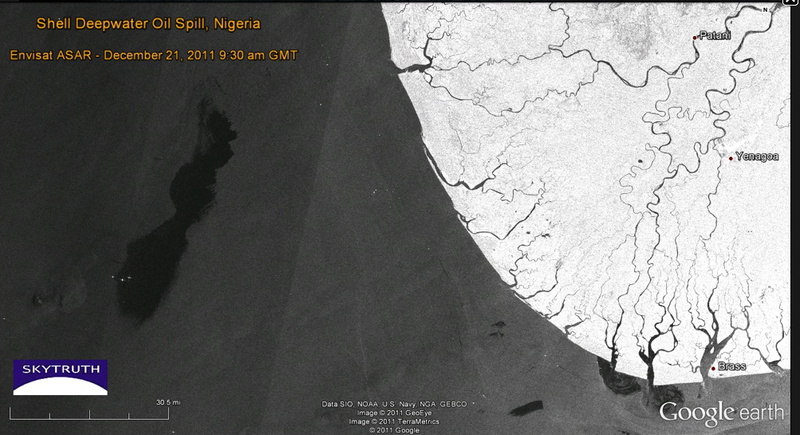 This map provided one of the few media sources documenting the Bonga spill not provided by Royal Shell Oil itself. Indeed, it only starts to track the implications of the spills, fires, and leaks in the Delta that constitute the largest wetlands in all Africa rich with swamps, estuaries, rivers and streams, and can only suggest the extent to which forests and mangroves are being polluted by spills from a network of pipelines, acid rain, and water-borne or rain-borne oil slick–rain regularly returns drops of crude oil to formerly fertile region–where oil is relatively close to the surface has led to a distortion of the environmental perils of oil extraction–and over one thousand abandoned oil spill sites in the over-drilled Delta, with huge environmental consequences–often blamed on the ships that regularly illegally siphon crude from the pipelines that criss-cross the delta. 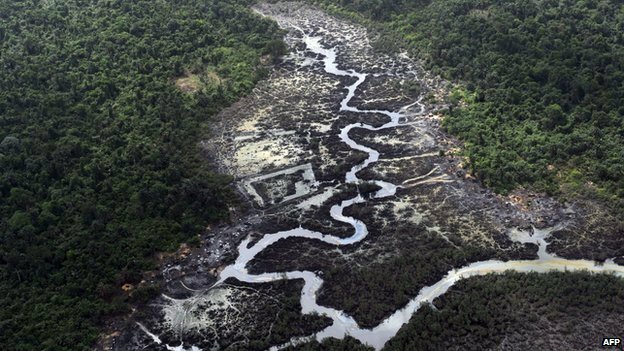 Google Earth views used by Sky Truth to map the 2011 Shell Deepwater spill barely chart the environmental devastation on the Delta rivers. The map that almost leaves one speechless in how the beauty of its sinuous detail chart the slicks of oil that have contaminated a once-healthy delta’s agricultural wealth; this NOAA aerial photography created by the United States Navy rebut the oil multinational’s silence as to the spill’s scope or devastating consequences, whose silences have only recently been targets of international blame, and obscured some 474 spills in one area during 2012 alone. Perhaps the recent expansion of Nigerian crowd-sourced mapping projects may shift these cartographical silences, but the burden for mapping the disaster has not been met. 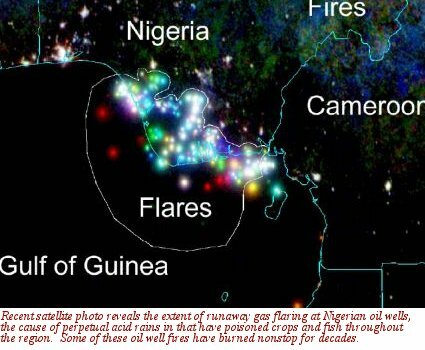 The narratives that these aerial image of considerable beauty recover present a counter-narrative to that of the corporations that distanced themselves from the Bonga spill, and perhaps a case of maps speaking truth to authority. 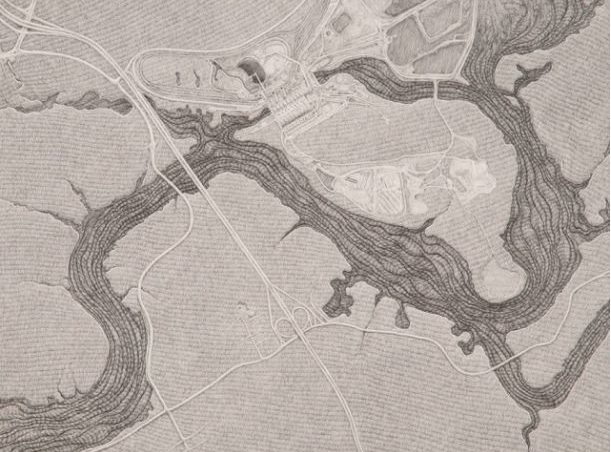 These maps begin to tell a story of the transformation of the land–and the destruction of the environment they map. These maps foreground new narratives about the Google Earth format that invite a broader story to be told about the event, and to fill the silence of Shell’s official narrative about the quantity or causes for the massive spill–and the blanket denial that any of the oil ever reached the coastline, and all barrels were successfully dispersed in the ocean waters, and seek “unconditional license to contain and disperse the Bonga oil spill” itself. 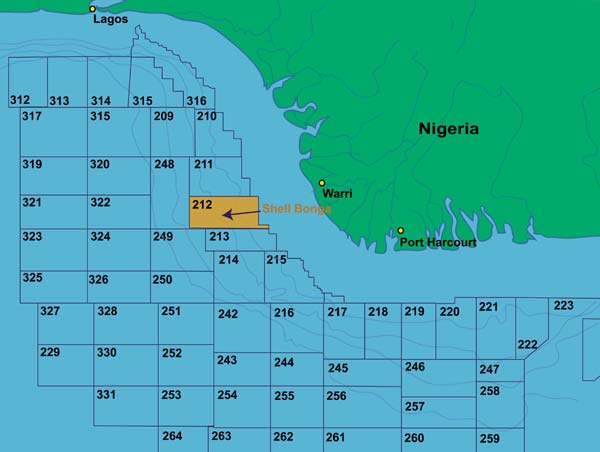 Without these Google maps, Shell Oil would have retained a monopoly about the production of truth about the devastating Bonga spill. Can a narrative emerge of this event from the perspective of those who dwell in the Delta, to capture the consequences of the toxic transformation of the land they live and work in, or those for its non-human inhabitants? 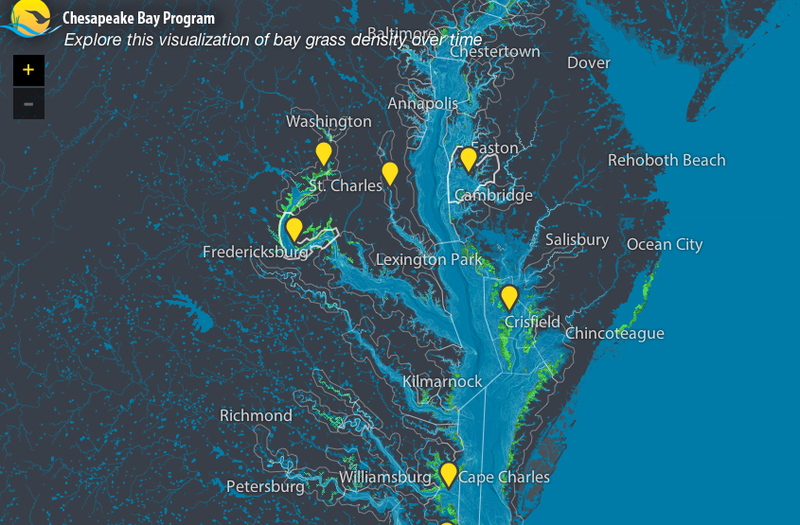 Some semantic possibilities of expanding the ecological narrative of place were suggested in the tracking of growth of Chesapeake Bay grasses, in a mapping project using data to track changes in the growth and density of grasses around the largest estuary in the United States particularly illustrative of the subtleties of overlaps to achieve the sort of deep mapping that Google Earth would not allow. The Stamen interactive map frames a unique narrative of the restoration of the estuary ecosystem incorporating data from over forty years across some forty years, redirecting data to create an image of where the estuary might later develop: the time-sensitive visualization of data about salinity, water-temperature and bathymetry with the restorations of bay grasses who are the subject of this narrative of ecological restoration, to offer a powerful–and positive–interactive map about the local recuperation of environmental health, by synthesizing a wide range of data from the EPA officials and local institutions about an area to reverse effects of chemical pollutants on wildlife and grasslands that viewers can read or virtually explore as unfolding over time, in ways that press against the technological boundaries of cartography as an art. If this graphic visualization of the watershed appears a document only of the growth of grasses, as we unpack the map we realize the expanse of the effects of the possibly narratives of human interventions in the landscape that it presents–both on the ecosystem of the estuary and to possibilities of our future relation to that very dynamic environmental space–a space we better know through our more multi-leveled representations of it. 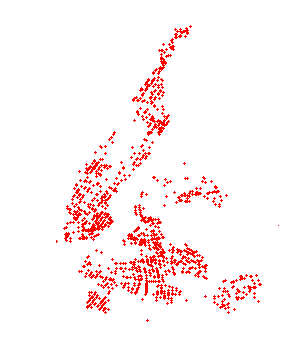 The art of registering knowledge of place has expanded to comprehend new personal individual narratives of fine grain by a GPS revision of the Google Map view of a city. Indeed, the maps of Christian Nolde and Ingrid Burrington both seek to recuperate the density of specific narratives of encounters in urban space that echo and engage the emerging forms of mapping by which Google seeks to plot points of interest for its users on the maps of cities that they visit, so that they might include selected points of interest, sites of beauty to visit, or local stores and commercial districts of interest judging by one’s web history. Both Nolde and Burrington used GPS to create a synthesis of these individualized maps of the city in ways that anticipated the announcement of Google’s plans. 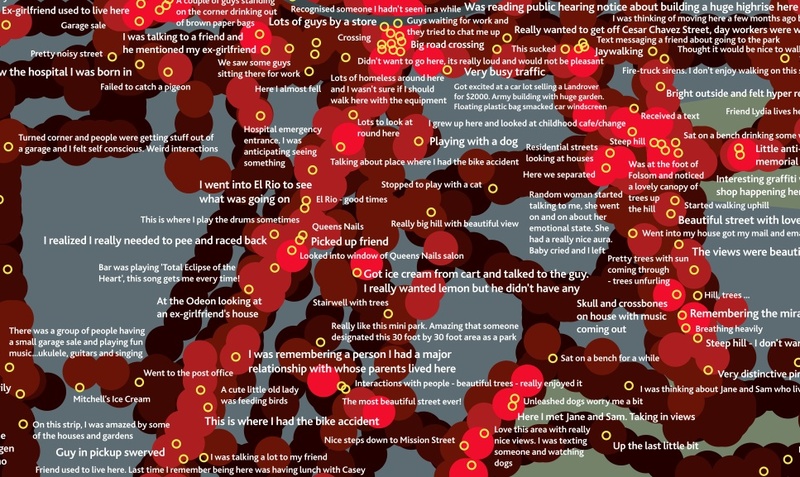 Christian Nolde employed GPS technologies to register of feelings related to place in his emotional map of San Francisco (2007), created during a tenure at Northern Exposure. 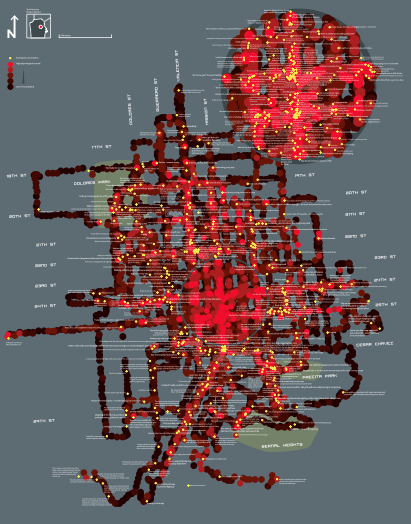 After collecting on data gathered by a galvanic skin response by which participants’ physiological responses, he keyed them to places that he transposed to a GPS map of the city’s locations, as if to trace itineraries in a city usually mapped by city blocks or along district lines. The maps seeks to register responses to a location or geographic environment on individual emotions, in a sort of counter-map synthesized individual responses into something like an encounter with places of specific individual resonance in the city, in a record “visualizing the emotional space of the city” by objectively tracing an alternate topography in 2007. GPS was used, in other words, to contextualize multiple narrative fragments in a composite view of the emotional significance of urban space by tracing if a residue of collective emotions on its surface. The completed artifact combines multiple spaces of reading, augmenting the notions of position that he noted in GPS at specific way stations by his own transient or apparently ephemeral personal reaction to the city at a specific place–“beautiful street with lovely houses”; “went into my house and got my mail”; “This is where I had the bike accident”; “i was remembering a person I had a major relationship with whose parents lived here”–that foreground the personal in ways GPS cannot alone register. The practice of GPS creates a synthesis of discrete meanings rarely associated with geospatial mapping, and puts a premium on emotional or associative precision, as much as the abstraction of terrestrial locations. 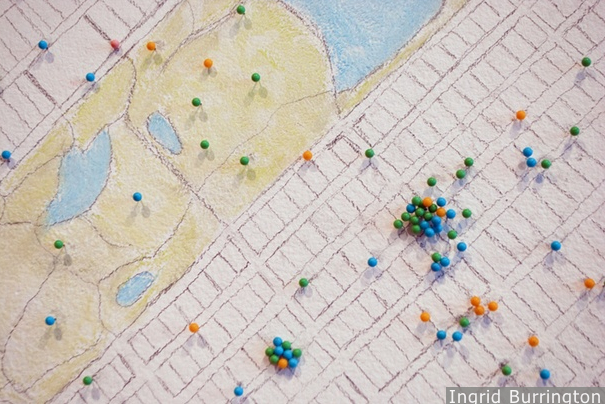 A similar desire to base a map on personal narratives to record the city as an emotive space led Ingrid Burrington to take data from Craig’s List “missed connections” as the data to reveal a hidden distribution of the desire for half-glimpsed connections in her “Loneliness Map” (2009-11), included in an earlier exhibit of personal maps Harmon earlier curated. 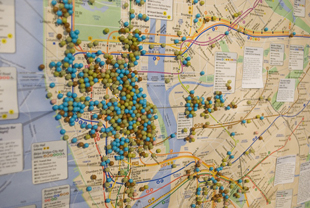 The map’s unique pinpoint form focusses observers’ attention on mini-moments of “missed connections” in the course of the day against a map of physical topography and street intersections, as if to present the variations among missed connections as an emotional terrain or urban psychogeography, creating a new sense of reading mapped data to register a notion first used by situationists such as Guy Debord. Such collected ‘mini-moments’ trump the topography of the city, tracking personal attachment to selective moments in urban space as more meaningful than the mapping of the outlines of its streets that create a new experience of reading the map’s surface. 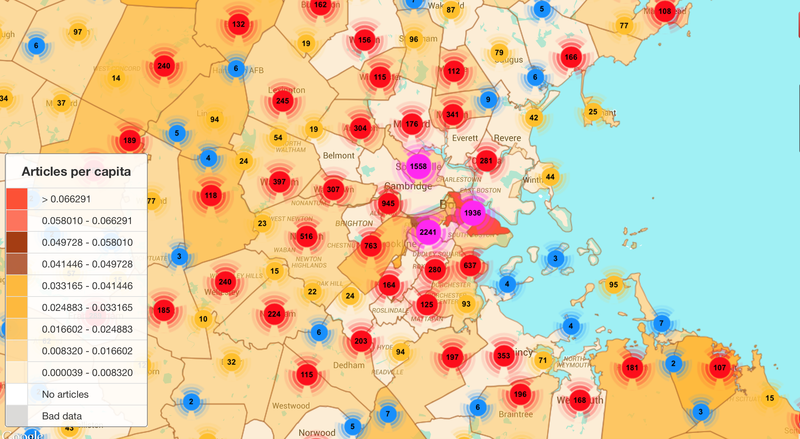 They recall the Mappiness (LSE) smartphone app, which disrupts the relative abstraction of space in a GPS framework by registering our own states of happiness on a map. The map becomes a site to register individual travels through the city in a collective document, or a capacious holder of narratives, as tangible with resonance as any map might ever be. And the very tangibility of this record of encounter that maps allow, even with limited qualitative content, suggest the underlying basis of cartography as an art.